This Week, Maren Morris Won An Honor For An Awards Show That Hasn’t Even Happened Yet. The 52nd annual Academy of Country Music Awards haven’t even happened yet — they won’t until April 2 — but the Arlington-sprung is already heading into that awards show as a winner. No, really: For whatever reason, the ACM Awards announce their “new artist” winners before the ceremony takes place, and Morris has already been deemed its “New Female Vocalist” honoree. Of course, come the completion of the ceremony itself, she could walk away with more hardware, as she’s also up for awards in five other categories at the damn thing. Anyway, it’s been that kind of year for sure for Yung Maren. 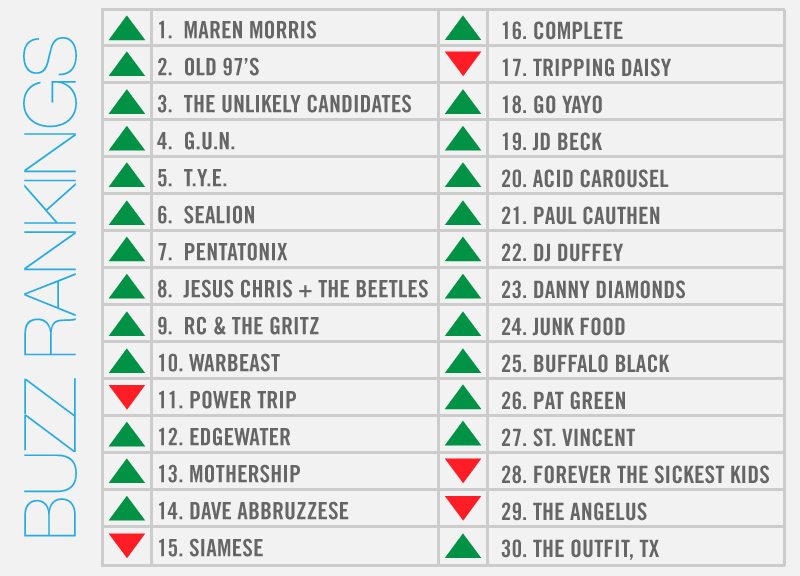 And, in turn, she’s taking home the top honors in our weekly Dallas-area music power rankings, too. It’s her 14th over No. 1. Just behind Morris this week is the Old 97’s, who played Conan this week with some help from Caitlin Rose but without their drummer Philip Peeples who made the trip but took a nasty spill shortly after arriving in Los Angeles for the taping. No matter: Conan O’Brien still enthusiastically received the performance, gushing hard on guitarist Ken Bethea’s guitar tone upon the completion of the band’s playing new single “Good With God”. The Unlikely Candidates, meanwhile, continue pushing their new album with some nice gigs, including stops at last weekend’s St. Patrick’s Day Parade Concert and at South by Southwest. Dallas emcee G.U.N., on the other hand, is celebrating the release of a new collaborative EP with Atlanta shout-rapper OG Maco. And T.Y.E. continued to impress us this week with the release of his latest music video. Seriously, we can’t wait to hear his album when it drops this summer. Speaking of new material, Power Trip is still riding high of the release of its new album, as fellow local heavyweights Mothership gear up to drop their new one tomorrow and OG heshers Warbeast are also prepping a new one to drop soon. Elsewhere: Drummer Dave Abbruzzese finally got the public recognition he’s been seeking from his old Pearl Jam bandmates, who’ve invited him to come along to their Rock Hall induction; Jesus Chris + The Beetles look like they’re finally getting the love they deserve as various local outlets have started to take notice of their new album this week; and SXSW continues its years-long in-joke of booking legitimately bad Fort Worth band Complete to play its fest. Previous ArticleWhat The Hell Is A Hip-Hop Book Club?